The GEF Gender Partnership is a network of experts working on gender and the environment in GEF Agencies, and in the Multilateral Environmental Agreements for which the GEF serves as a financial mechanism. 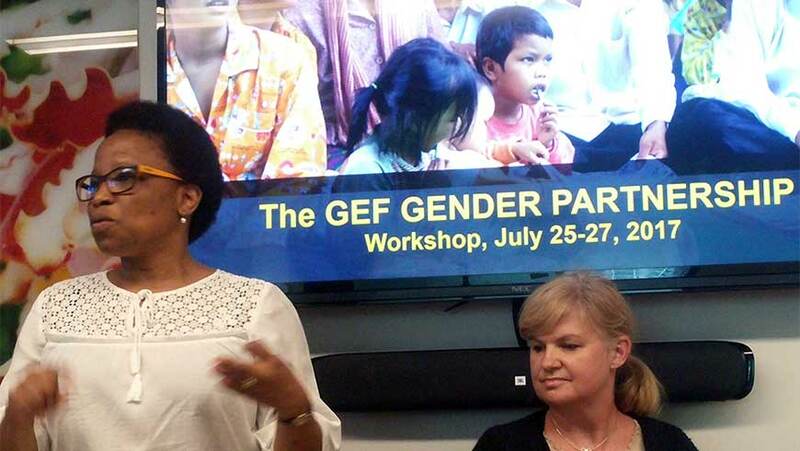 From July 25-27, the GEF Gender Partnership gathered experts from thirty international and civil society organizations to provide ideas on how to mainstream gender into GEF-7 programming. It also provided feedback on the forthcoming policy on Gender Equality which tries to maximize opportunities for promoting gender equality and women’s empowerment in its programs and projects. Since 2015, the partnership has worked to support GEF’s gender mainstreaming efforts by building a network of gender and environment specialists in GEF Agencies, and in the Multilateral Environmental Agreements for which the GEF serves as a financial mechanism. The workshop was opened by Françoise Clottes, Director of Strategy and Operations for the GEF. “We have seen progress in the area of gender equality in environmental work, but it’s not enough”, said Ms. Clottes. “We need to actively catalyze projects that have the potential to materialize greater environmental impact through gender-informed approaches.” She underscored the importance of gender in GEF projects, and thanked the GGP members for their contribution to recent achievements. These included a decline in the number of gender-blind projects as confirmed by the Independent Evaluation Office, and a recent GEF portfolio review that identified good practices and examples of projects and approaches that explicitly recognize and connect gender equality and women’s empowerment with global environmental benefits. The GGP discussed and provided technical feedback in consultative sessions on the draft GEF’s policy on Gender Equality. The new policy sets forth an ambition to move the GEF from a “do no harm” gender mainstreaming approach towards a gender-responsive approach that introduces specific actions to reduce gender inequalities and support the empowerment of women in the context of GEF’s mandate to protect the global environment. The GGP strongly supported this approach, and the GEF Secretariat welcomed the collective experiences, expertise and suggestions of the GGP to ensure that the new policy will deliver on this aspiration. GGP members were also invited to discuss the proposed “Impact Programs” of the upcoming GEF-7 programming cycle. These programs build on the integrated approaches piloted in GEF-6 and focus on tackling some of the main drivers of global environmental degradation. The group shared experiences and collectively identified entry points to address gender inequalities and empower women in areas such as food systems, cities, energy and sustainable forest management. The meeting has ended, but the work to build on its recommendations and work to mainstream gender in GEF-7 and beyond has just begun. The new GEF Policy on Gender Equality is expected to be approved by the GEF Council later this year. As the GEF moves into GEF-7 with a new policy and strategy on gender, the Secretariat will continue to rely on GEF Agencies and the GGP to translate the group’s ambition into results across GEF projects and programs. Gender and biodiversity joint gains: myth or reality?